Every modder today will already have some sort of case lighting I think. 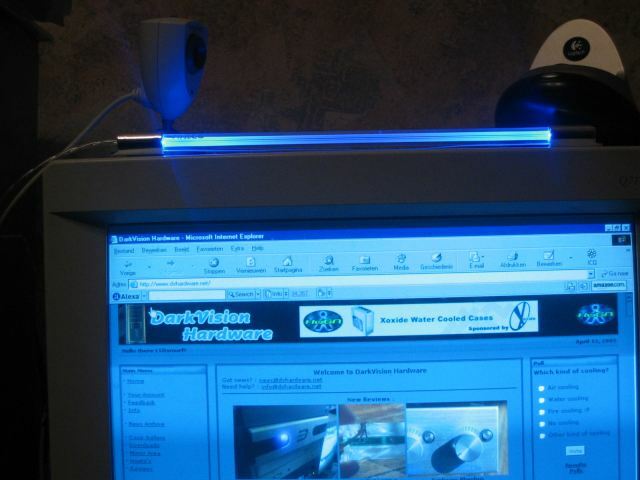 If it isn't a Cold Cathode then maybe a LED Fan or some LEDs. But Antec thought why only our case? 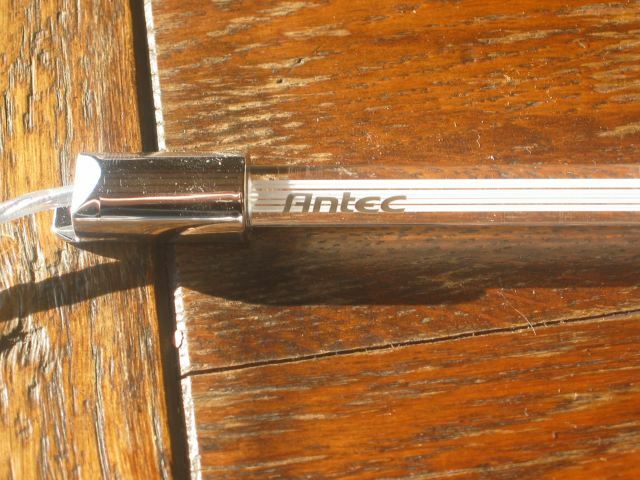 So they designed the Antec iLuminate LED Light Tubes line. 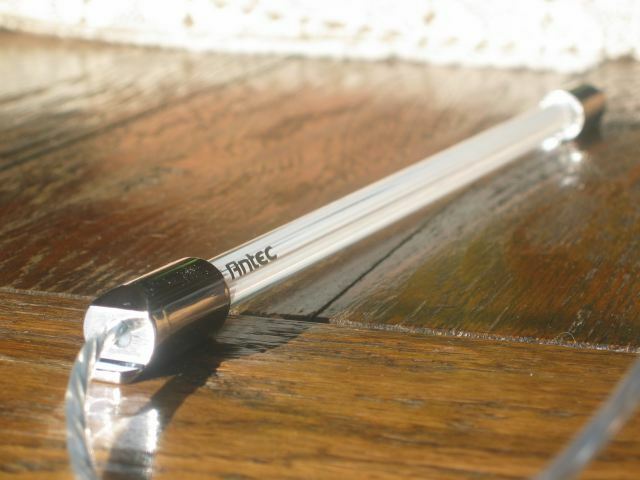 These are LED light tubes to light up your desktop or room. 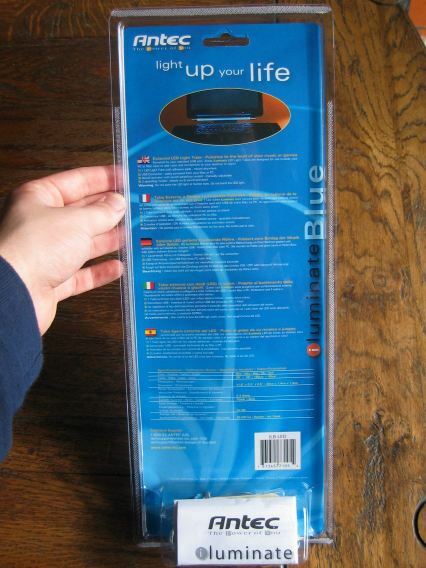 Today we take a look at the Blue Light Tube. 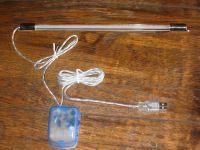 In the box I found the LED light tube together with the sound activator, a short installation guide and three adhesive pads. On this picture you can see the LED light tube and the sound activator. The LED light tube is 30cm long and has 2 bright blue LEDs on both sides. The tube is made out of clear plastic, the LEDs are housed in the two metallic looking plastic ends. 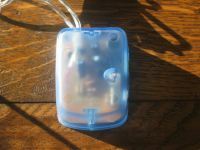 The sound activator is made out of clear light blue plastic. The cable lenght from the tube to the sound activator is 60cm (23") and the cable lenght from the sound activator to the USB connector is 150cm (59"). This should be long enough for everyone I think. This is the sound activator, it has a clear light blue plastic housing so you can easely see the PCB board and all the other stuff on it trough the plastic of the sound activator. On the right side of it you have the choice to turn the tube off, sound activated or always on. To the right you also have a sound sensitivity controller. Now I plugged in the USB connector into a free USB port and turned it on. There's a LED on the Sound Activator. When you turn it on 'Sound Activated' it turns green, when you turn it to 'Always on' it turns red. 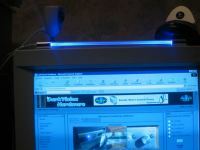 Now I decided to mount the Light tube on top of my screen. I've started playing some music and turned the sound control to maximum. The LEDs went on and out to the beats of the music and it was cool to see. Another cool usage is during games. If you're a fan of 1st person shooters then you could for example 'fine-tune' the sound activator with the sound sensitivity controller so it only reacts to suddenly intense sounds like gunshots. Very cool effect! 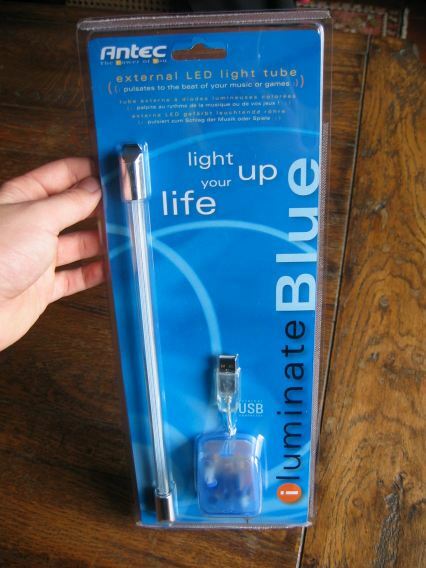 If you want full illumination then you have to turn it to 'Always on'. In complete dark it was capable of lighting up some parts of my room, not as much as a Cold Cathode ofcourse because these product only has a pair of LEDs. I estimate it at about 1/4th of the brightness of a Cold Cathode. 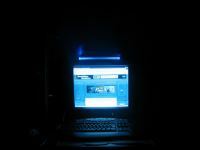 The only problem I saw with it was that it distracts you a little when your working on your PC because it's so bright. 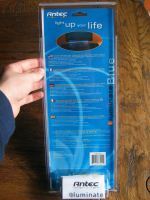 This depends a little on the place were you place it, especially on top of your monitor it can become annoying sometimes. 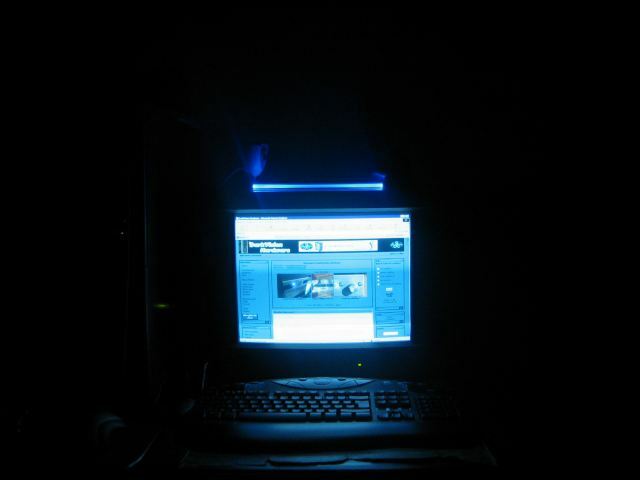 So I placed the light between my case and my monitor. 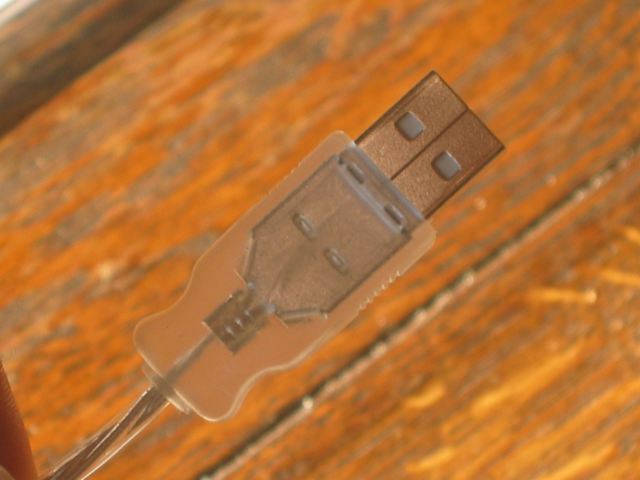 Now you're maybe wondering how the LED on the other side of the USB cable gets his power? Like you can see on this picture there's a wire running over the back of the Light Tube. Just look out so you don't accidentaly cut it off or so.. 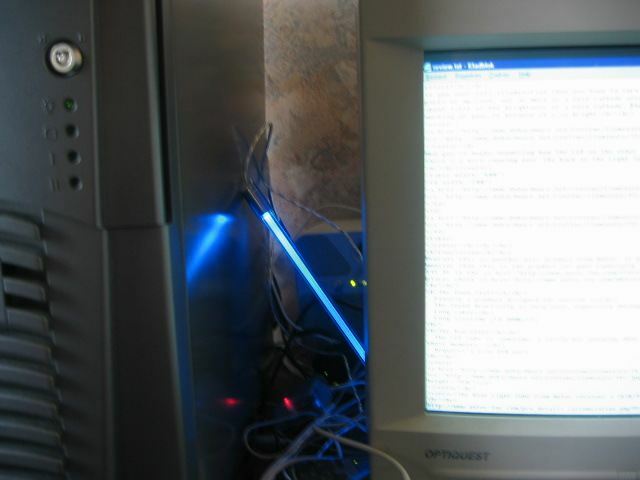 In the picture under this piece of text you can see the blue Light Tube from Antec together with a blue Cold Cathode from Lamps Electronics. 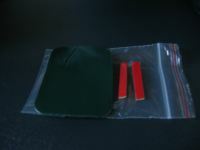 The Cold Cathode is a little bit bigger but not much only a centimer or 2, the thickness is also almost the same. The Cold Cathode is designed for inside use in your case, the Light Tube for outside use. 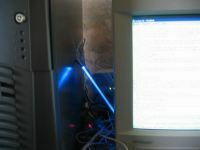 The Cold Cathode is powered trough an inverter with a Molex connnector, the Light Tube gets his power trough an USB connector. 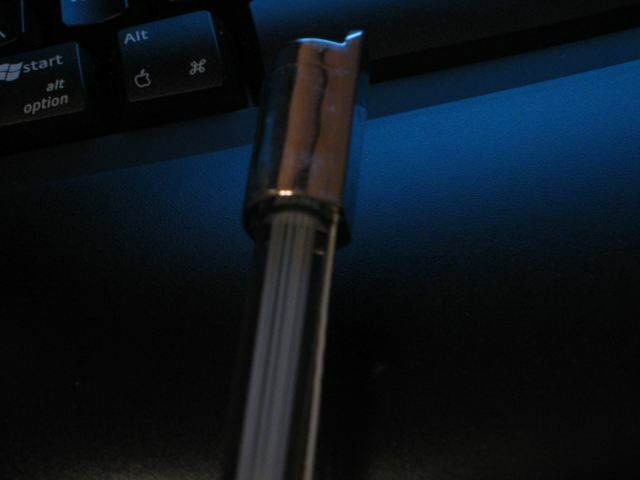 Overall I found that the Light Tube protected the LEDs better than the housing of the Cold Cathode. 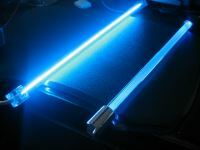 The Cold Cathode is ofcourse a lot brighter than the Light Tube, I think about 4 times as bright. 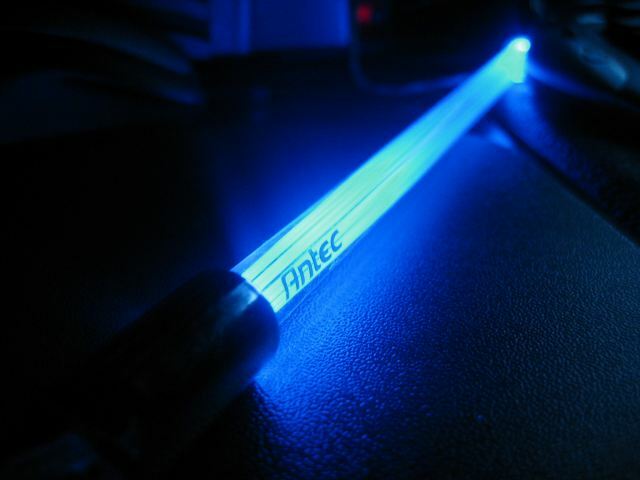 Some people might see this as a bad thing, but I think it's good because something as bright as a Cold Cathode on top of your monitor will drive you nuts :P.
Overall this is another nice product from Antec. 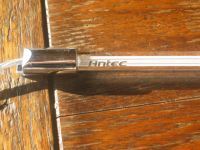 If you're looking for a product to light up the exterior of your PC or monitor than this is the product for you! 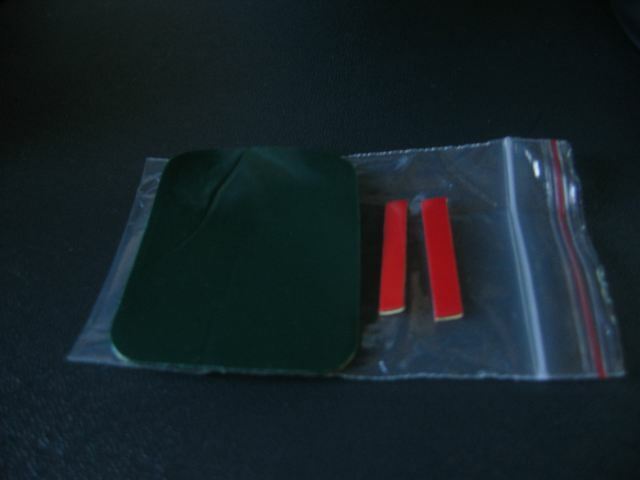 Especially the very cool sound activator makes this a pleasing product. Price is $15.95 in the Antec Store (for the US and Canada only), for other places check here. I just ordered it so I cant say if it meet my standards, but I definately have the usb ports free if i need to buy more than one, I have 12 ports to work with. 4 on the back of my pc, 4 on the front, 2 on my keyboard and 2 on the monitor. I have a feeling that I'm gonna need to buy anotherone to get the desired brightness that I'm craving. Sound sensitivity is low, but I got it to place above my keyboard tray so I could find the right keys when typing in the dark (as I am now). If you mount the box to your keyboard, you can get it to flicker each time you press a key when typing. I must manually push that button to choose color and turn the light on, kind of annoying, also since I use it on an old htpc to get a kind of better power status, this bug doesn't help me at all, or did I use it wrong? I just picked this up for 5 dollars at comp usa, non-bargain rack. It's really my first "mod", although all you do is plug it in and stick it somewhere. The sound sensitivity isn't the best even if placed ontop of the speaker, and it cycles through all the colors when in sound-mode, not just one static color..didn't know that till after I purchased it. The plus is being able to pick from a variety of static colors without having to stick to just blue or red for the life of it. A plus for those who like to tweak with the mods on their PC or Mac. Thumbs up. I'm starting to wonder if mine is defective. When I set it to Sound Activated... I get nothing unless i tap it pretty hard, even when the sensitivity is set to the max. The always on mode works no problems though. sound sensitivity not sensitive enough even at maximum sensitivity. Music needs to be turned up real loud, or "inverter" needs to be real close to your sub. I have a 600 watt system with an 8" sub and i still need to turn it up. Finnaly a company has done something I've been dying for! There are NO negative things about this product, as far as I can tell... it deserved a 10/10 !!!! Why does this get a score of 8/10? I didn't see anything in the review that justifies removing two points. In fact, I didn't see any negatives at all. 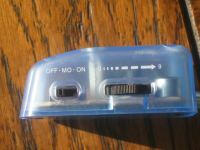 Requiring a USB port is listed on the box as a requirement - that's not a negative (Besides, how else should it be powered? Ten C batteries? A wall plug for the already overloaded power strip? Solar Power? Honestly! USB is excellent. The new computer I installed for my brother comes with 8 USB ports, and my older computer only has 4 USB ports. What kind of ancient computer only comes with 2 USB ports? Can I see this computer in the Smithsonian?). Isnt it a bit lame to say that its a con, that it requires a usb port??? 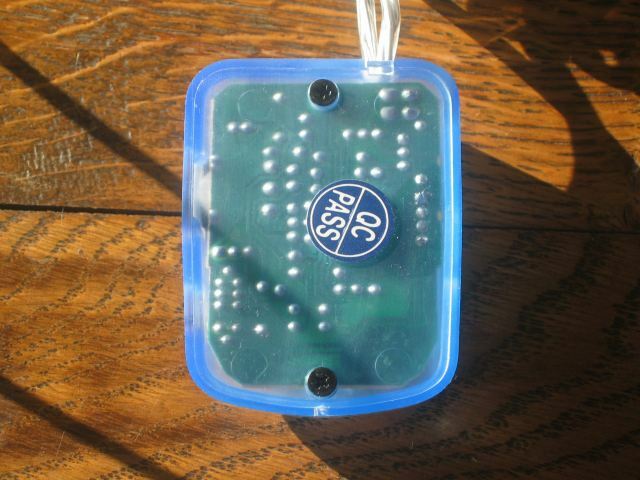 Its supposed to be connected to it. How can that be bad. Should it require a COM port in stead or what?